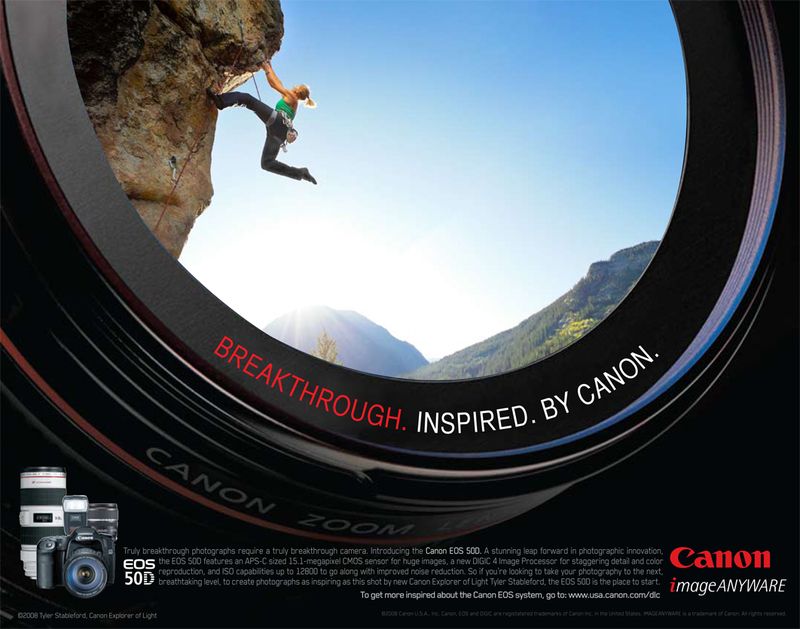 The new Canon 50D national ad campaign features my shot on Independence Pass near Aspen. Looking for a powerful action shot, we chose to feature rock-climbing, as I wanted to shoot a product that shows off some adventure photography. This is one of the favorite spots to shoot here locally, as this is far from our first rock-climbing shoot. There are great spots to both shoot and climb all over the pass, and it was a great time. I am happy to represent an area so close to my hometown as a part of a national campaign. Our crew shot a sunset and sunrise gig, camping at the base overnight to take advantage of the beautiful light. This is one of the many times I have shot with Jessa, as she is a great climber! She is a go-to model for many of our climbing shoots, and it is always a blast to work with her. Her energy really completes the shoots, and makes the images that much better. Thank you to the athlete Jessa for your amazing strength and grace, as it really made the Canon 50d national ad campaign. And to my first assistant Draper, another thank you is deserved, for enduring the hours of hanging on the wall alongside me! Your help with lighting, gear, and shooting added to the shoot as always, and I am happy to have such a great person to work with behind the cameras.